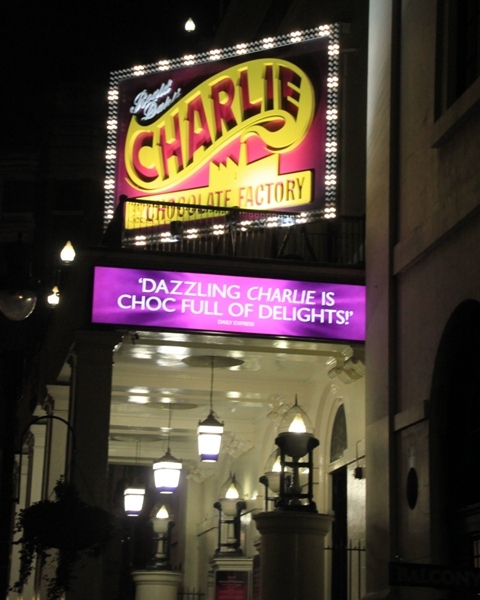 Roald Dahl fans in our house one and all, our interest was aroused when we first heard about the West End’s new biggie – Charlie And The Chocolate Factory. Not too sure what the great man would have made of the Sam Mendes creation at the Theatre Royal in London but we loved it. Massive sets and amazing special effects we thoroughly enjoyed this new adaptation of the much loved classic. Son was presented with his golden ticket on Christmas morning and was beyond delighted with this unexpected Christmas present. I was beyond delighted with a post Christmas weekend in London. Not so difficult to get tickets too, we only started looking in November and managed to find great seats for an evening performance mid January. Not cheap but no surprise for a top show in the West End. 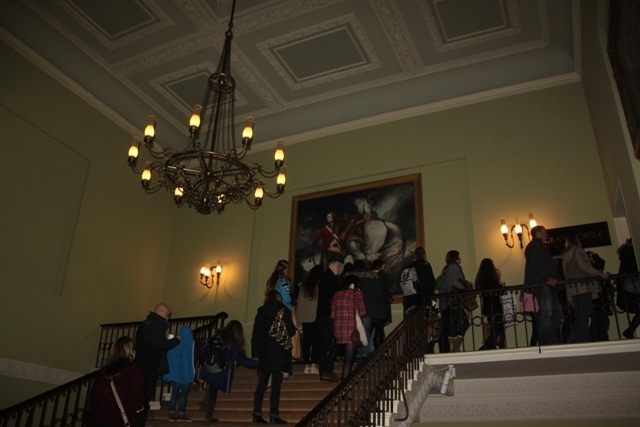 Speaking of which I was so impressed with the Theatre Royal on Drury Lane – stunningly beautiful inside and out, there are ornate staircases, artwork on the walls and a feeling you are somewhere special. The show is not a replication of the movies and puts a different twist on the story. I found that refreshing. The budget was of the multi-million pound variety and it shows – massive sets and amazing special effects together with tons of gadgets, a bright sugar candy landscape and a true feast for the eyes. 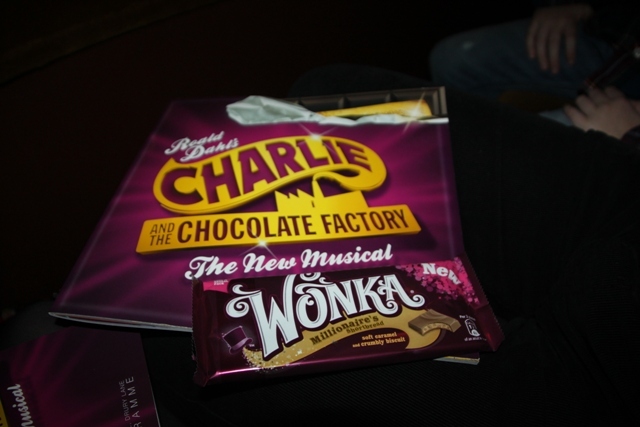 We started our evening with a Wonka bar – delicious – and settled in to watch the show. Enthralled, I don’t think any of us were able to tear our eyes from the stage for even a second. Charlie appeared rummaging through an enormous pile of rubbish and the whole of the first half was centered around his corrugated tin house. The grandparents were in bed and did some nifty routines without setting foot on the stage. Some reviews criticised the first half as being too long and too dull. I didn’t agree. Charlie’s impoverised family on their cabbage soup diet and lack of belongings was touching, a bit Dickens like and the greyness of the stage set made it very atmospheric. There was a wonderful scene where Charlie writes a letter to Wonka, makes it into a paper dart and then throws it into the audience. We watched the dart fly above our heads into the gods – such a simple trick but so effective. One of my favourite parts in the first act was the use of the giant television hovering over the main stage in glorious technicolour to introduce the other children. A bright flash contrasting sharply with the greyness of Charlie’s house. You don’t enter Wonka’s factory until the second half. We all loved Willy – extremely charismatic, a bit disconcerting and very memorable he stole the show. The sets were stunning and watching the unpleasant children meet their sticky ends in various ways was clever and gripping. Great details everywhere and the killer squirrels and Oompa Loompa’s were spectacular. The show’s climax involved a great glass elevator and all too soon it was the end with Charlie taking over Wonka’s factory. I wasn’t so keen on the new music – not so memorable and the only tune running through my head was Pure Imagination – the most memorable and the only one used from the original movie. Perhaps though with time and familiarity the other songs would grow on you. There were quite a few children in the audience but a remarkable number of adults without kids proving this show is family friendly but appeals to everyone. Spectacularly entertaining I’m sure this will become a West End classic. Son’s only disappointment and negative about the whole thing was that we weren’t able to go back and see it again the next night. Praise indeed. That’s cool! Wow, what a surprise for your son and fun for the whole family. It was such a great show for sure – supposed to be his Christmas present but we loved it just as much!! That sounds wonderful. We are all Dahl fans in this house too. I think an experience like that makes for a wonderful present. We were desperately looking for alternatives to a gift that involved screen time (although that would have gone down well with him!!). It worked really well though, he was thrilled, we got a weekend in London and everybody enjoyed the show – I’d do this again for sure. Sounds amazing. Fingers crossed that it comes our way eventually! One of our Christmas gifts was a trip to see the Mary Poppins musical which was a huge hit with the family – three cheers for getting out of the house in January! 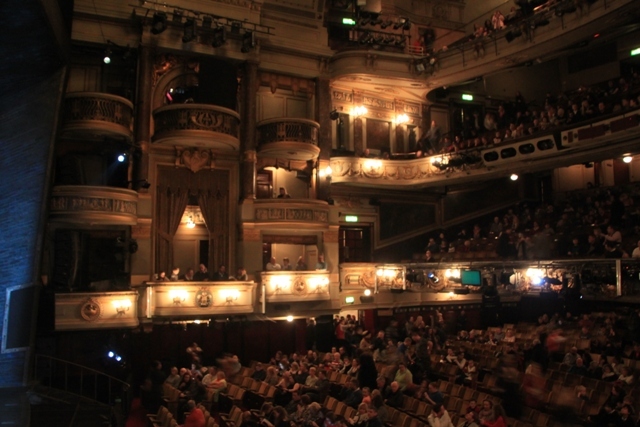 You just can’t beat a theatre trip – definitely a great January treat!! We’ve seen Mary Poppins a year or so ago and we all absolutely loved it too. I know exactly what you mean about the new movie – I much preferred the old one! However our son is mad keen on both so we’ve seen each of them a lot in our house!! The show is wonderful though, sometimes I think a movie or a show can’t live up to the book but not in this case. We all loved it. Ohhhh that is my favorite childhood movie! I must see it on Broadway! Mine too!! I still love the movie – the show is wonderful, I don’t think you would be disappointed!! Sounds like great time! I loved the book and movie, and would love to see this! It’s wonderful – we had such a great evening, the show was incredible and we all loved every second! We had such a great time Pam – the show was so good and the West End is always a treat, as you’ll know!! We saw Mama Mia when it came on tour a few years ago – loved that too but think it’s just that bit extra special in London. Thinking about catching a show in London’s West End? Our friend Joy from Joy Loves Travel shared her thoughts on the new production of Charlie and the Chocolate Factory. Great review! I reblogged it – hope that’s okay with you! No problem at all Anna! It’s a great show – we highly recommend!! What a great Christmas gift, and surely one that will be remembered for a long time. This past fall we introduced our children to both of the movie versions after reading the book. They found Gene Wilder a bit scary and Johnny Depp a little bit too weird. The actor who played Willy Wonka in the play sounds like he did a fantastic job. I think they’re spot on with both the Willy Wonkas – I always remember finding Gene Wilder quite scary too and Johnny Depp is definitely weird. Our son being that bit older is now a big fan of both movies – we would watch them every weekend if he had his way!! The show was pitched just right though, nothing weird and nothing frightening! It was a great show – definitely recommend it if it comes your way, we loved the effects and seeing the story on stage was just magical. Would you recommend it for a 6 yr old who finds the monkeys in Wicked too scary? Those monkeys in Wicked are pretty freaky – creepy and a bit evil, I think they’re a bit scarey too!!! Nothing like that at all in this show, even the squirrels that take Veruca Salt away are like big teddy bears!! My Son used to get scared though at the strangest things when he was younger, mostly things I would never have expected. I think this show would be fine though! Thanks Sara – it was the best show I’ve seen in a long time, but a trip to the West End is always a winner for me!! That looks amazing. I’m a huge Ronald Dahl fan, I would love to see it myself. I hope it comes to the states soon, thanks for sharing! I think even if you weren’t a Dahl fan it would be a great show. But for a fan, well it’s fantastic Robin – definitely recommend it if it comes your way!! The first time I tried to watch the Gene Wilder version on television, I was so scared by what was happening to the kids that I turned it off and went to bed. I think I made it through the entire movie the next year. This show sounds wonderful. I hope to see it. Thanks for the review! I know what you mean Diane – they say Roald Dahl wasn’t too keen on children (apart from his own!!) so seeing some of them come to a sticky end can be a bit unsettling when you’re little!! The show is magical, we all enjoyed it so much and would definitely recommend! 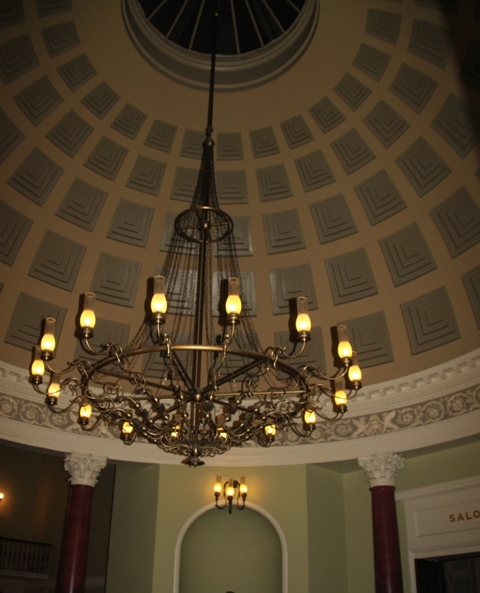 I was blown away by the theatre Rosemary – not what I was expecting, very grand and opulent, I don’t think I’ve ever been in a theatre quite like it. The show was wonderful – we all loved it and it was lovely to head off to London post Christmas! We really really REALLY enjoyed the production! Thanks for sharing it again. Brings back memories of what an entertaining production it is. Seems like no expenses spared on amazing sets and hope it might make its way down under because I would love to watch it again. We bought the tickets for our son but all of us absolutely loved it too, such a great show. We said we’d go and see it again in London if it doesn’t tour – our son would go next week if he got the chance!! Sounds like an incredible experience. I’ve never watched a huge production like this. It was amazing – this production is so full of great scenes and colourful sets – we loved it so much we all agreed we would go back and see it again! Now this is a musical we would love to go see. We hope it makes its way to Sydney. But what a shamel there is new music… Do they have the Oompa Loompa song still?? No, no Oompa Loompa song – much to all our disappointment!! We were so looking forward to that…… The music isn’t bad, it’s just not the familiar stuff everyone loves…. still it’s a great musical, if it makes it your way I would definitely still recommend!! 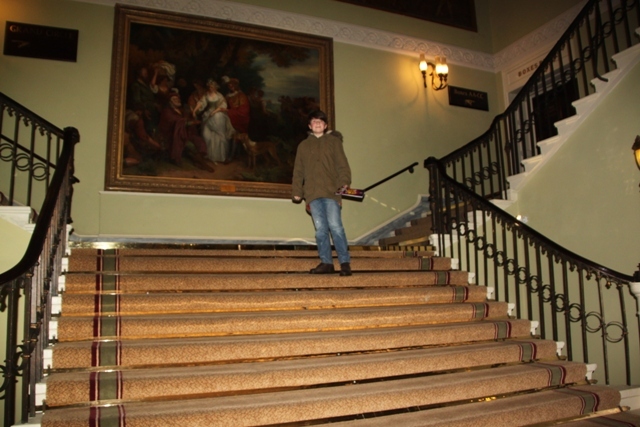 Highly recommend it Tanja – we all just loved it and would have gone again the next night if we’d been able!! Charlie was one of the best I’ve seen in ages! !